By Air: The closest airport is El Calafate at 255 km, with regular flights from Aerolineas Argentina and Lan Argentina airlines. By Bus: From El Calafate there is a daily bus service to El Chalten. Once in El Chalten a private shuttle or one of the regular excursions can be hired to get to Lago del Desierto. By car: From El Calafate take National Route 40 North or from Tres Lagos go South until the junction with Province route N23, then turn west 94 km till El Chalten town is reached. Once you drive through the town, head North on N23 and drive 37 km along Las Vueltas river on the gravel until you arrive to Lago del Desierto South point. The car can be parked in the public parking lot. Close by there is a national guard base. It is not a private parking lot. 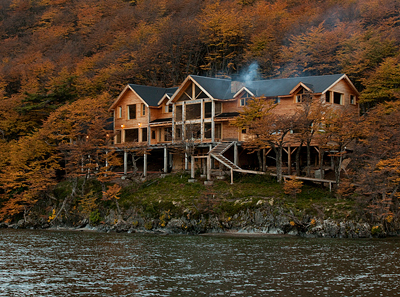 Once by Lago del Desierto South Point, a boat from the Lodge will meet the guests and take them on a 15 minutes ride along the East shore of the lake to get to the Lodge. If prefered the guests can choose to leave the luggage in the boat and get to the Lodge by a 3 hour hike through the forest. For your convenience, you can call the Lodge (tel: 01141525697) to adjust time of arrival at the Lake in case of any delays.